LG G Flex was one of those niche devices that may not sell well, but still make enough of an impact to leave an honorable footprint in history. The G Flex received mostly positive reviews both from the press and the early adopters. It may not be the best seller the G2 and G3 flagships were, but it was still a milestone LG definitely needed in its portfolio. The original G Flex was designed and built around a seemingly simple recipe, including a curved body, a curved P-OLED display, and a self-healing coating over the back. Of course, as a premium top-tier device, LG G Flex has to pack the latest available tech by the time of release. Today, LG introduces the next generation curved smartphone - the LG G Flex2. It follows the basics established by its predecessor, building upon its major principles and developing further the features that made the G Flex so attractive and popular. So, the new LG G Flex2 is now official and the launch is almost here, too. The new Flex2 features a smaller 5.5" P-OLED curved display, but with higher 1080p display resolution. This means you'll be getting a nice and lively P-OLED display of 403pp density, which is more than enough. And the curved screen indeed looks gorgeous, especially when you are enjoying high-res multimedia content in landscape orientation. The LG G Flex2 is currently the most powerful smartphone to date. Sure, the Snapdragon 810 chipset ticking inside will make it to a plethora of devices later, but few of them will offer displays of 1080p resolution. The lower display resolution will give it a noticeable edge over the competition and the G Flex and it octa-core processor plus the latest Adreno 430 will be benchmark toppers for sure. The beautiful LG G Flex2's display is protected by a piece of Corning Gorilla Glass 3, but LG has enhanced it further making it 20% tougher than the usual. LG says Corning had no part in creating the improvements in the proprietary dura-guard glass. Speaking of toughness, LG F Flex2 might be quite durable on the front, but it also comes with an impressively protected rear cover. It follows the steps of its predecessor, introducing an even better self-healing coating that "heals" up to 18 times faster. LG claims everyday scratches and dents disappear for about 10 seconds at room temperature. This is indeed quite an achievement but we are yet to test how this turns out in real-life usage. The rear cover is removable, but the 3,000 mAh battery is not user accessible. You can just hot-swap the microSIM and the microSD cards. 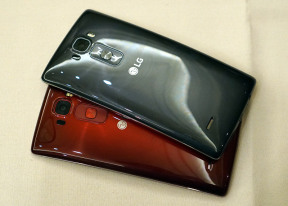 LG G Flex2 will launch this month in Korea in Platinum Silver and Flamenco Red colors. Both look great and thanks to the rear protective coating covering the glossy material, fingerprints and smudges are highly unlikely to stick. You bet the rear control deck LG is so proud of is here to stay. The keys and placement are very similar to LG G3's, and there is no hump at the back as it was the case with the original G Flex. The volume rocker has a nice dotted pattern. Above the rear controls is the 13MP camera sensor, the same as on the LG G3. It features OIS+ optical stabilization, and it works side-by-side with the laser autofocus LG has been offering on its G3 top phones for a while. A dual-LED two-tone flash is also around, helping you achieve better low-light shots. LG says the camera shoots better quality images compared to LG G3's but we are yet to put this to the test. The top of the LG G Flex2 packs an IR blaster, which somewhat became a mandatory feature for flagships in the recent years. It will allow you to control remotely various devices across your home, the TV being the most targeted one, of course. The bottom of the G Flex2 has the microUSB port, which has been upgraded with fast charging capability. LG is providing a compact 2.6A wall charger, which will charge the G Flex2 a lot faster than usual - up to 50% in less than 40 min. This isn't as impressive as Oppo's Rapid Charging, but is still faster than most of the smartphones out there.